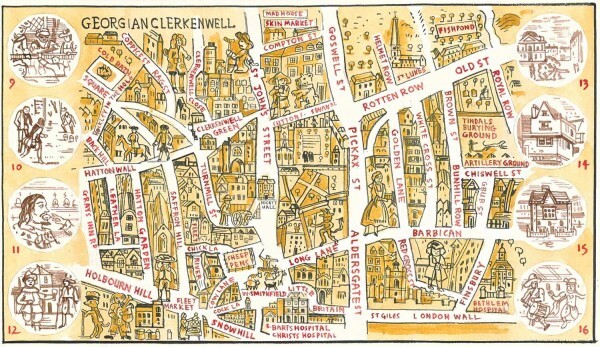 It is my pleasure to present the third exhibition from Spitalfields Life - Adam Dant, Unusual Cartography of East London at Town House, 5 Fournier St, Spitalfields, opening next Thursday 15th September and running until Sunday 2nd October. At the rear of an eighteenth century weavers’ house is a beautifully proportioned doctor’s surgery of the eighteen twenties, where you are invited to come and scrutinise the jewel-like originals of Adam Dant’s wonderful and strange maps that it has been my privilege to publish over the past year – maps which have established Adam Dant as London’s pre-eminent mapmaker extraordinaire. 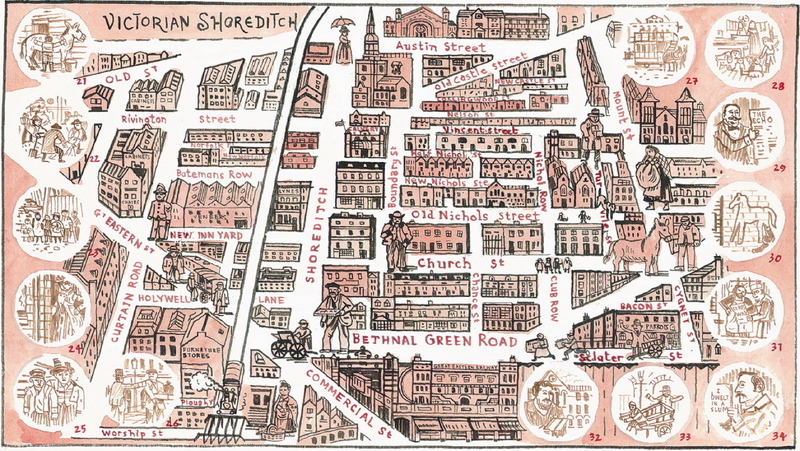 Most excitingly, the centrepiece of the exhibition is The Map of Spitalfields Life drawn by Adam Dant with stories by yours truly, showing fifty people who make Spitalfields distinctive. 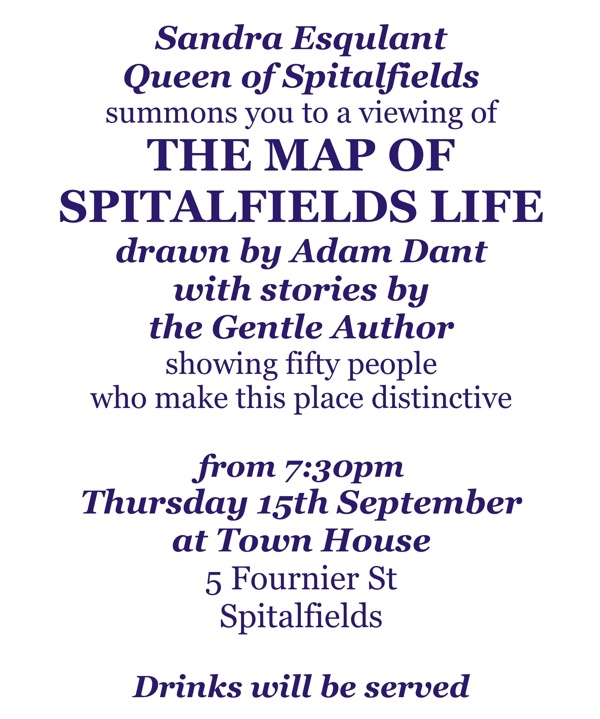 Please join us next Thursday for drinks from 7:30pm to view the map on the night of its unveiling to the people of Spitalfields by Sandra Esqulant, landlady of the Golden Heart in Commercial St. 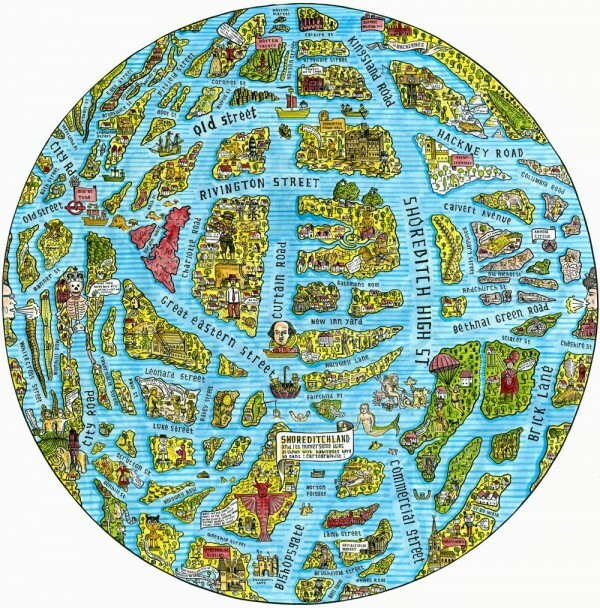 Many of the characters you have read about in these pages will be present to discover how Adam Dant has represented them on the map – so this is your chance to come and meet them. 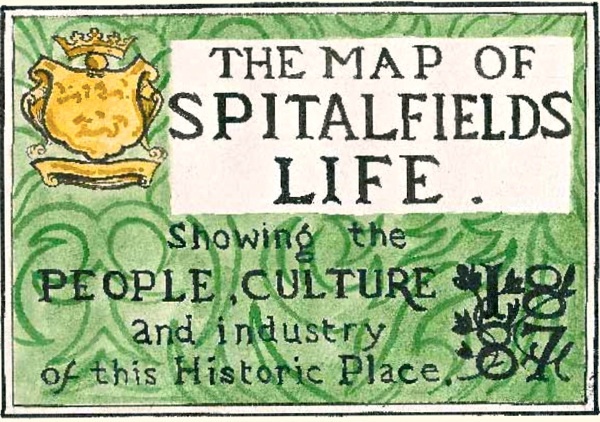 The Map of Spitalfields Life will be published by Herb Lester and – once it has been unveiled – full-colour copies will be on sale at £4. On the reverse, you will find the stories of all the people portrayed on the front, plus a guide to Spitalfields landmarks and destinations. 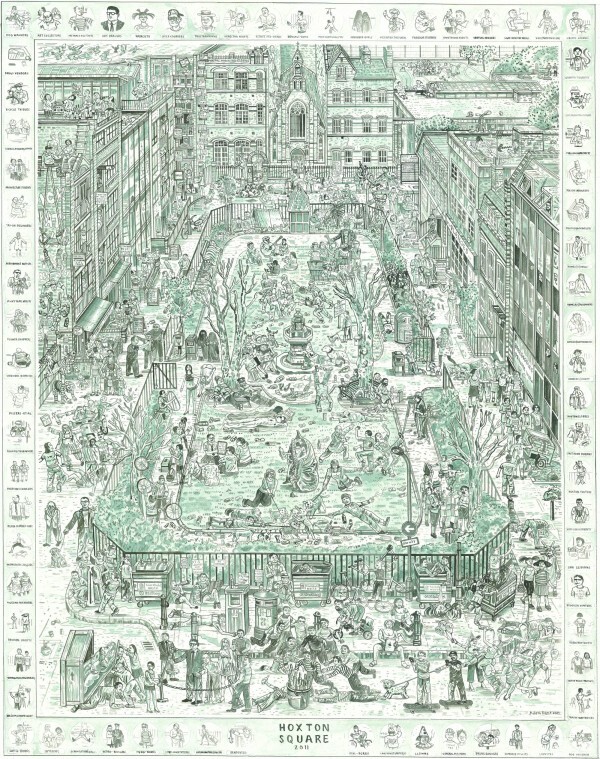 Adam Dant is also producing a hand-tinted limited edition for collectors and Spitalfields aficionados. 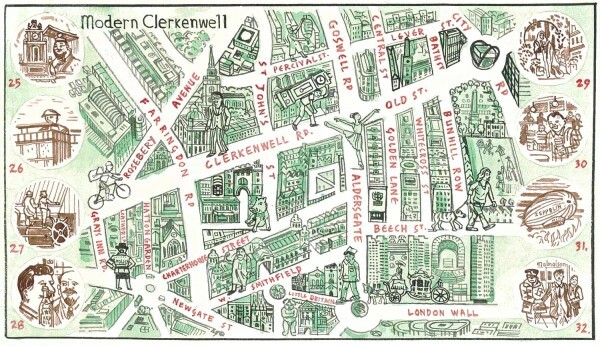 Overseas and out-of-London readers will be relieved to know that, from 16th September, you will be able to buy these different versions of the map online at www.spitalfieldslife.com and have them delivered to your door. 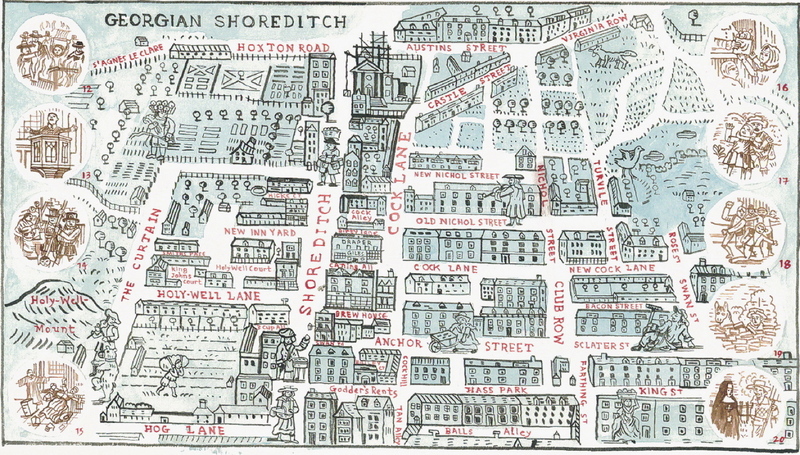 Adam Dant and I have been burning the midnight oil to contrive The Map of Spitalfields Life for your delight and we can barely contain our excitement to show it to the world next week. The map has been produced under conditions of the strictest secrecy and, at this moment, Adam Dant and I alone know who is on the map. Today, I have been running around Spitalfields like the White Rabbit, delivering invitations to the unveiling. Yet although those who get an invitation are confirmed of their place on the map, they will not discover who else is on it until Sandra Esqulant unveils it. Already rumour, gossip and speculation about the map are spreading like wildfire through the narrow streets of Spitalfields, and we anticipate this conflagration to reach white heat by next Thursday. I do hope you will come to join the party. The exhibition at the Town House, 5 Fournier St, London E1 6QE is open every day except Monday from 11:30am until 5:30pm, and at other times by contacting Town House. 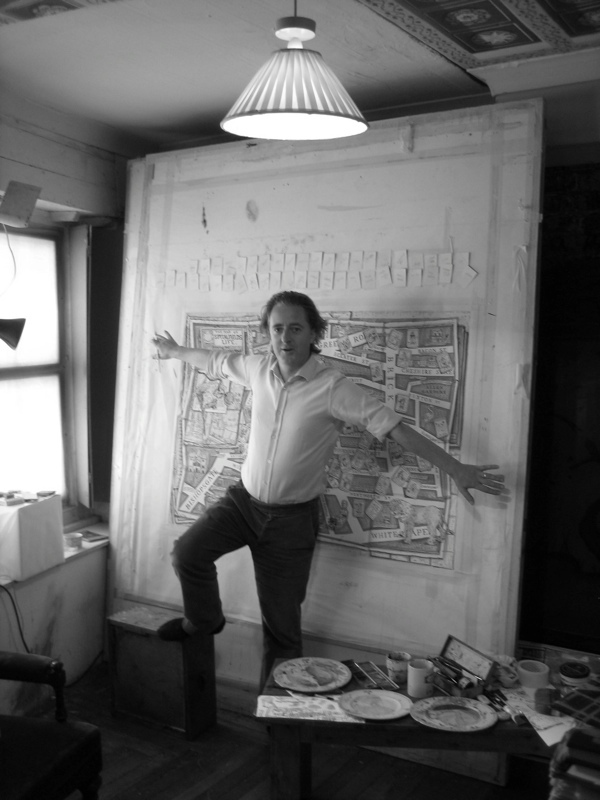 Adam Dant tries vainly to hide The Map of Spitalfields Life from prying eyes. 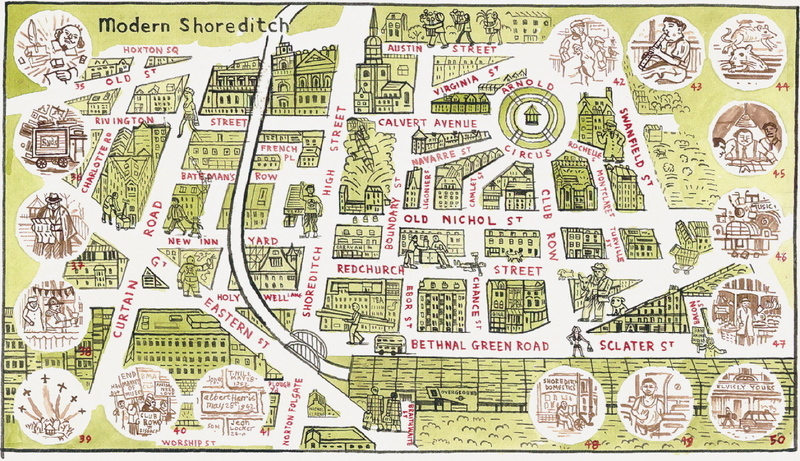 Map of the Stories of Shoreditch, Old & New. 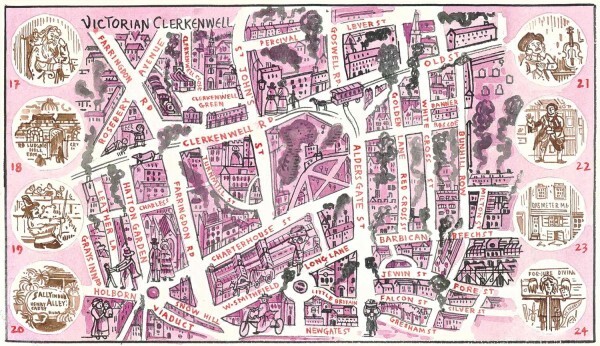 Map of the Stories of Clerkenwell, Old & New. The Map of Hoxton Square. 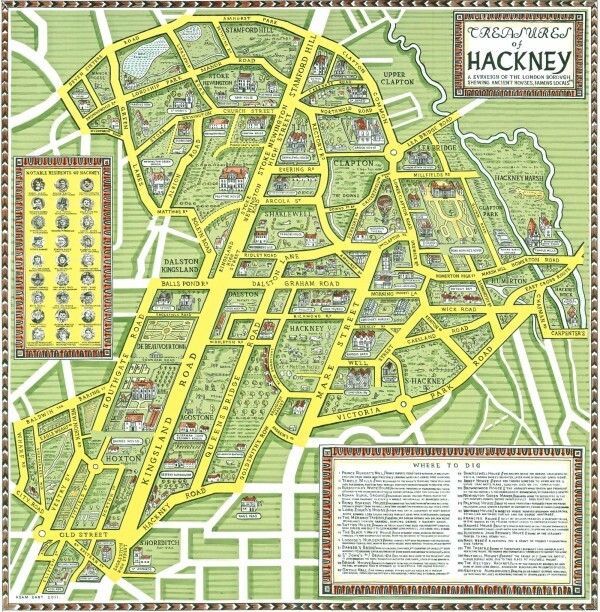 The Map of the Treasures of Hackney. 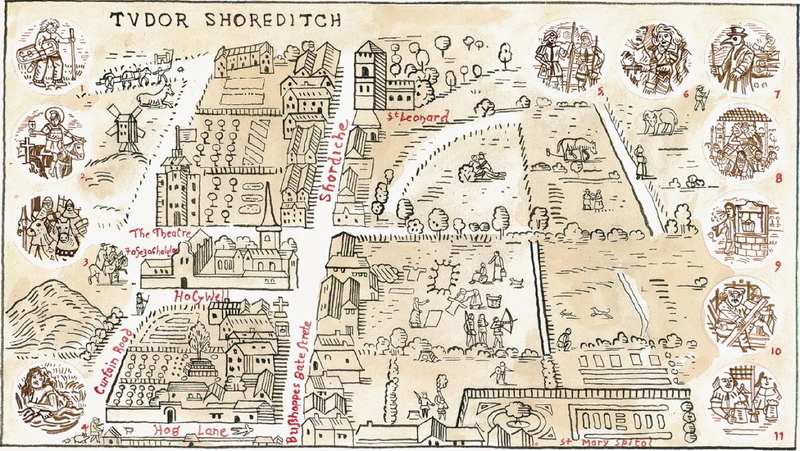 Donald Parsnips’ Plan of Shoreditch in Dream Format. 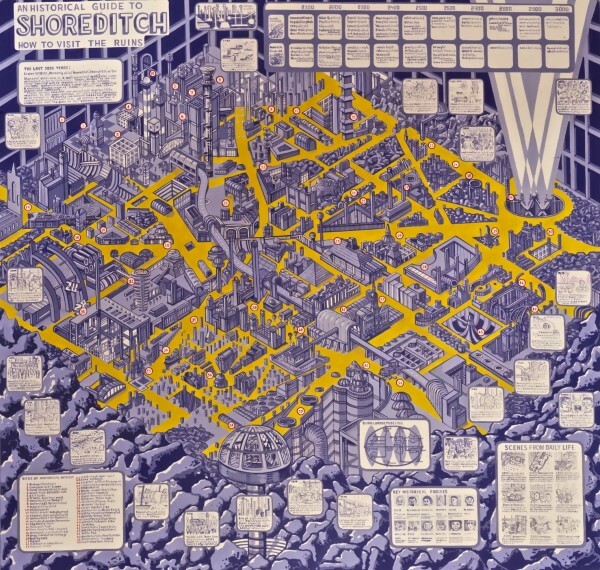 The Map of Shoreditch in the Year 3000. As a Yank, I am in awe of your long history! Wish I could see the maps in person and have one of those drinks that are being served. Cheers! Oh! How I wish I could be there! I’ll bet the evening provides the seeds for ever more of your wonderful postings. Just a question. ‘Fournier Street’. Who is this particular Fournier? Not the former Bishop of Pamiers, scourge of the Cathars, who became Pope Benedict XII in 1334, surely? He’s a bit notorious in the south of France, but surely not in Shoreditch? Fournier St is named after George Fournier, a man of Huguenot descent who left money for the poor of Spitalfields when he died in 1834. Lovely to see one of Adam Dant’s ‘House of Fairytales’ pieces at the Pallant House Gallery in Chichester on a day trip last week. I will have to seek out some more – maybe Adam could do a map of where his pieces have all ended up! Ah, I love a good map! 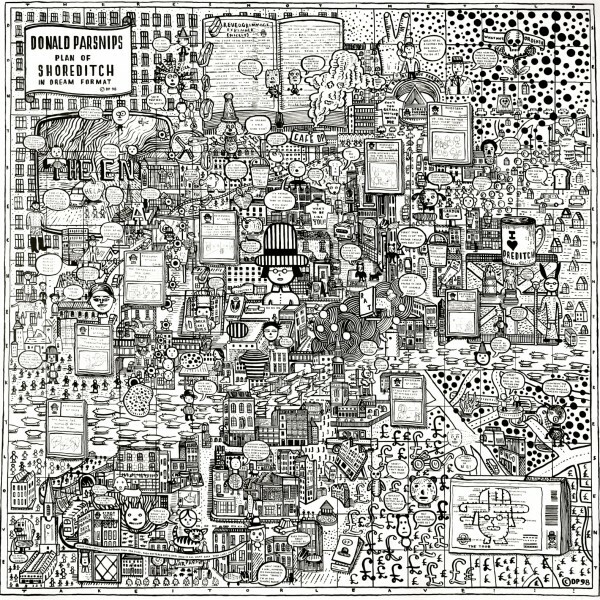 It would be great to have a copy of some of them to go with my old map of London and also my original Tube Map poster! Oooh, sounds great! 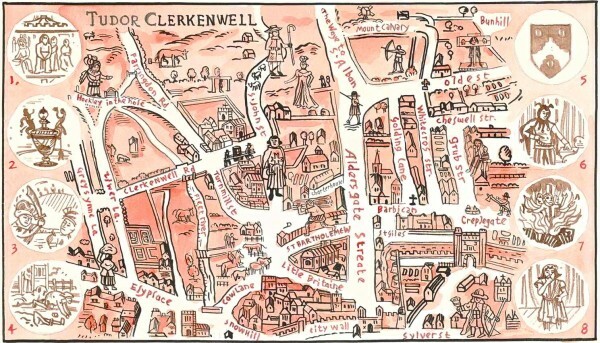 I love Adam Dant’s maps and this latest one celebrating Spitalfields Life and 50 of TGA’s characters is a wonderful idea, a ‘must see’. We’ll be there. Londoners – the best people in the world. As always, your site brightens my day. I am in NY and unemployed so it will be a while before I visit London again. But I’ve learned so much and have plans to make Spitalfields and it’s environs an important part of my visit. Thank you. Thanks for putting me right about George Fournier! This looks too good to miss. I shall be in London from Ankara for two days from October 2 and shall definitely be there for the last day. Shall have to buy a copy, too. Maybe they could hold one back? And yes, Mary Walton, Londoners are the best people in the world. Congratulations. The maps look wonderful and I’m sure your words will compliment them perfectly. Enjoy the function, wish I could be there too. Is that Joseph Markovitch on the lower left hand side of the map of Hoxton Square? Someone should let him know about the viewing, I’m sure he would enjoy it! Thank you TGA for organising what is bound to be yet another wonderful event. Hello there. What wonderful maps. I’m definitely going to come along to see these – hopefully on Saturday. What are the opening times for the exhibition? 11:30am – 5:30pm Adam Dant will be there to greet people on Saturday & Sunday afternoon.